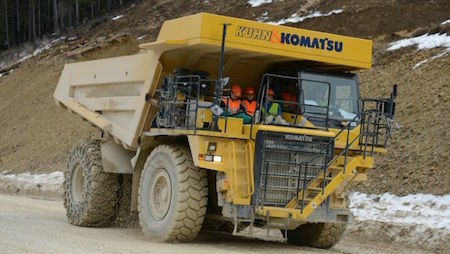 This Komatsu quarry truck may not set records for quickness like a new Tesla, but it does something that no semi-autonomousTesla in the world can do. It actually generates more electricity than it consumes. It's a Komatsu quarry truck that's being modified by Kuhn Schweiz and Lithium Storage, weighing in at almost 50 tons (45 tonnes) and powered by a whopping 700kWh battery pack. Here's the really cool part: each round trip actually generates electricity. Because the e-Dumper goes up the mountain empty and descends carrying 71 tons (65 tonnes) of rock, it captures 40kWh on the way to the cement works via regenerative braking. But climbing back up to the quarry only requires 30kWh, so every trip will feed an extra 10kWh into the local electricity grid. Not bad when you then consider that the e-Dumper will be doing that trip 20 times a day. As far as I know, sf writers never thought of this, not even the great Poul Anderson, who wrote about electric trucks in his 1956 novel The Corkscrew of Space. Naturally, science fiction writers have thought about harvesting power from human movement, among other scenarios; take a look at this article detailing 10 Exotic Human Energy-Harvesting Devices. Great story from Ars Technica UK.